Population : 172 million, the sixth most populated country in the world after China, India, the United States, Indonesia and Russia. The Brazilian population is mostly young, with 62% under the age of 29. Religion : there is no official religion, all though at least 90% of the country is Roman Catholic (Brazil has the largest Catholic population in the world). There is also an enormous variety of religions associated with African animist divinities. Capital : On the 21st of April 1960, Brasilia was officially inaugurated as the new capital of Brazil. However, the second largest city, has stayed the cultural capital and the more famous city. Principal cities : Brasilia, Rio de Janeiro, Sao Pãolo (with more than 10 million inhabitants, Sao Pãolo is the most populated city in the country), Salvador, Belo Horizonte, Curitiba, Recife, Porto Alegre. University cities : Rio de Janeiro, Sao Pãolo, Belo Horisonte, Brasilia, . 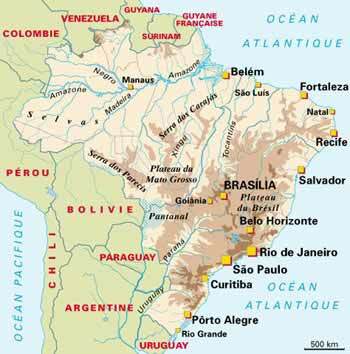 . .
Student population : more than 18% of the adult population in Brazil is illiterate. In 1988 there were 1.5 million students among 817 higher education establishments. In 1989, there were 902 institutions of third level higher education in which 93 where universities. The Brazilian constitution of 1988 allocates 25% of its federal and local tax revenues towards education.